The stage is set for war. Oil prices are surging to record highs. A new dictator is rising in Iraq. China is threatening Taiwan. North Korean forces appear ready to strike south. Israel is feverishly trying to complete the Third Temple. And in the midst of a world ready to explode, American president James MacPherson's second term is ending. Now as a fiercely contested presidential election campaign approaches, America faces its greatest threat ever . . . one from which it might not recover. From New York Times best-selling novelist Joel C. Rosenberg comes an explosive new political thriller addressing the question of what, if any, role the United States will play in the end times. This book is sure to provoke discussion and controversy, along with fervent hopes that this frightening vision of the future will not come true. Like The Ezekiel Option this is a fast-paced, bone-chilling scenario that grabs the reader. But just as it gets exciting Joel reverts to preaching to the reader. I respect most of the teachings of the prophet Yeshua of Nazareth but I don't need to have him show up in every chapter. That was also my criticism of the Copper Scroll. As the author of "Tehran Mission" I was able to draw on Joel's outstanding knowledge of militant Islam and encouraged to learn more for my upcoming sequel. Thanks for the inspiration Joel and keep those books coming. I enjoyed the end to this series; but as others have said you definitely need to have read other books in this series first otherwise you'll be lost. Dead Heat will have you sit up straight and pay attention. The attack on the US is an effective one, done with a devastating, primarily low tech approach. Without the right leadership in office, this country will surely collapse if this scenario or something close to it is ever played out. Rest assured our enemies and those who hate us, and there are many, are reading this book with a possible script/plan or approach to our demise. But then this book plays out an apocolytic drama where good loses for the moment and of course the rapture occurs and many of us will not make the first cut. Tribulation, if true, will be very discomforting and perhaps painful and we as a country will play a very low profile role. I just finished reading "Dead Heat" today and short of saying "WOW" I am at something of a loss for words. 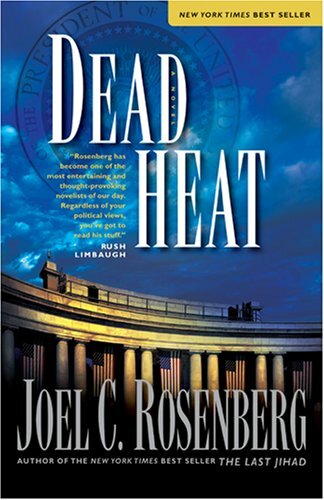 I have followed Joel Rosenberg from "The Last Jihad" until now and I have enjoyed all of the books in the series, but "Dead Heat" blows them all away. Out of five stars, this one deserves a seven. I would place this book in the top two or three fiction books I have ever read and in the top 10 of all books I have read. I will not give any of the story away for those who have yet to read it, but some of the plot twists in this book really shocked me and to be honest I didn't see them coming. One Plausible Outcome ~ Sad & intriguing at the same time. When this book puts away the "you must accept Jesus Christ as your savior" rhetoric, it is very, very good. In fact after the first 10 chapters I looked it up to see if there were other novels in a series as some characters were obviously previously introduced. I wanted to put an order in for all the others in the Jihad series.. but then I read the rest of the book and realized I didn't need to order any more at all. There are seriously long stretches when it feels like you are in a church being preached to and other times like you are being actively converted. I once skipped 12 pages straight of "accept Jesus" talk (I skimmed it). Then I went back and read it because I wanted to make sure I wasn't missing something. Nope. There are agonizingly improper and unfathomable personal relationships (one character seems to know every head of state/important person on the planet) and even more frustrating communicative issues all over the place. You know when you see in a movie when someone dies and the cop or authority figure has to tell the kin that their loved one is dead and they start by saying "I hate to tell you this..."
Anyway, how would you react if a cop came to your home and said "I hate to tell you this..." and you said "what?" and he said "well, um....." and you said "yes? tell me please..." and he said "well, um....." and ON and ON and ON for minutes (pages it seemed) and with more than one set of characters and multiple times. I can forgive all that, after all the story is GOOD and worth reading. In fact if someone could re-edit the book and take out much of the religious preaching it might have been one of my top 10. I guess maybe it's me, I do not like being preached to.. I can handle all the "prophecy" regardless if it has zero connection to facts (Yes, I know the bible well) but a thriller book (or series) shouldn't be a recruiting tool. I am not going to give any spoliers but just beware that if you are NOT a religious person this boook will definately put you off. The main action line involves the discovery of a potential plot to kill the president at a political convention where he's giving a speech. There are few details to go on, but security is convinced they've done as much as they could do to protect him. That is, until the nuclear missiles are launched from container ships right off our own shores. And it's not just directed at the president, but at a number of major cities such as Washington DC, Seattle, Manhattan, as well as Los Angeles. Based on saber-rattling that went on right before the attack, the new president is convinced that China is to blame and wants to launch a full-scale retaliation. But if that assessment is wrong, then the world will be plunged into a nuclear nightmare. Obviously every nation in the world has a vested interest in making sure this situation doesn't get out of hand, but there are a few murky players in the background who are all watching this unfold according to a larger plan. If you're a Joel Rosenberg fan, then I'm sure you'll love this book as I did. Regardless if you believe in Rosenberg's worldview, you still should take his stuff seriously. He does a great job at taking our current affairs and speculating with how things could end up. I gave it four stars, since I don't think that it was his best novel - and doesn't entirely measure up to other political thrillers (from a writing standpoint). This man is right on the spot! This was the first book in a long time where I actually put off reading too fast it because I didn't want it to end. I loved this book from start to "finish". I say "finish" because I keep hearing that this is the last book in the series but I hope it isn't. Joel did leave the ending open in the spirit of `The Lady or the Tiger'. This book had the classic storytelling of Joel written all over it. The pace is non-stop, the destruction is great and brutal, the enemies are satanically evil, and the "point-of-no-return" world changing events are jaw dropping! I loved how Joel put pieces of the apocalypse in the story and you literally have to go back and re-read it because you're like "huh?, what?". It must have taken me as long to read the final few chapters as it did the whole book because of everything that was going on and because of the magnitude of everything going on. But Joel has a way of writing so that the story isn't crowded with all the action and angles. This book is very, very sad because some of my friends that have been with me since book #1 have some very bad things happen to them and people around them. Joel tells the story and does not spare anyone when the story called for it. This book is also pretty brutal and cut-throat. The violence is high but not gratuitous. The bloodshed is here but it's doesn't drive the story. I found each of the five episodes very difficult to put down, but Dead Heat was virtually impossible to get away from. I found myself up late into the night, not wanting to set the story aside, until I couldn't hold my eyes open any longer. When the United States finds itself targeted by an unknown enemy, all hell literally breaks loose in this incredbile conclusion to the story that began with the nearly prophetic The Last Jihad. I can't think of much to say without spoiling the entire story, and this story is really one that deserves to be read by everyone. Whether you're a fan of Christian fiction, theology, thrillers, suspense, or political drama, Dead Heat (and all of it's predecessors) will certainly please you. If you really want to know more about this story -- if you really need more reason to read it -- then drop me an email and let me know, and I'll be happy to share more details of the story with you. Of course, you'll only be cheating yourself. This is absolutely the best novel I have read this year (sure, the years is still young, but I bet that statement will still be true six months from now). Do yourself a favor and order a copy today. Cannot put this book down! Clancy fans do not read this. It's full of annoying, preachy evangelical banter and it's ideas are NOT biblical. For example, the book ends with the Rapture, which is not biblical, and is found nowhere is the scripture cannon. The Rapture teaching starting with a minister in the Church of Scotland, Edward Irving, in the 1830s. It is NOT biblical. Mr. Rosenberg is a fine fiction and non-fiction writer. He writes with full understanding of Ancient Prophecies (told by Ezekiel, Zechariah, Daniel, etc.). With all of modern technologies flowing worldwide, we'd be lucky if this action-filled-page-turning fictional book is only just that. I highly recommend reading this book as well as recommending it to the silver screen. I have not read or listened to the previous books in this series, simply because of a lack of reading time, though I am well aware of them and their general focus. I decided that I would listen to Dead Heat which is most applicable to world events right now (June 2008). First, the reader and production are excellent. While a book is nice to hold and read, this reader, who uses a plethera of different voices and accents based on the characters from around the world, totally brings this story to vivid life without confusing the reader. Great job! Second, as a Christian, I found Dead Heat to be very realistic...not a prophecy in and of itself, but there is no doubt that much in this book could happen very much as described, or similarly. I already feel a great sense of urgency with regard to the upcoming rapture. I know where I'm going, and I have no fear for myself, but I do worry for those who are not saved - those who are indifferent, or like at least one other reviewer of this title, scoff at the truth. So, whether you find this story sensational or realistic, if you are a Christian, truly consider what we know is to come and be a bold witness for the Gospel. If you aren't a Christian, try to listen to or read this book with an open heart and be willing to give unbiased consideration to the Bible as truth. After all, it is your eternal soul that is at stake.